KIGOMA, Tanzania, Aug 3 2012 (IPS) - At the Kakonko Health Centre, about 250 kilometres from the nearest hospital in Kigoma Region, Western Tanzania, assistant medical officer Abdu Mapinduzi prepares to operate on Joanitha, a young pregnant mother. She has given birth via caesarean section three times before at a regional hospital. But now, for her fourth child, she is able to have the baby at her nearest medical health centre. Despite the fact that the Kakonko Health Centre is 150 km away from Joanitha’s home village, it is still closer than her nearest regional hospital, which is the only other facility able to conduct caesareans. Health centres here cater for 50,000 people, approximately the population of one administrative division, but are not equipped to perform surgeries. They are the third level of health care in the country after village health and dispensary services. 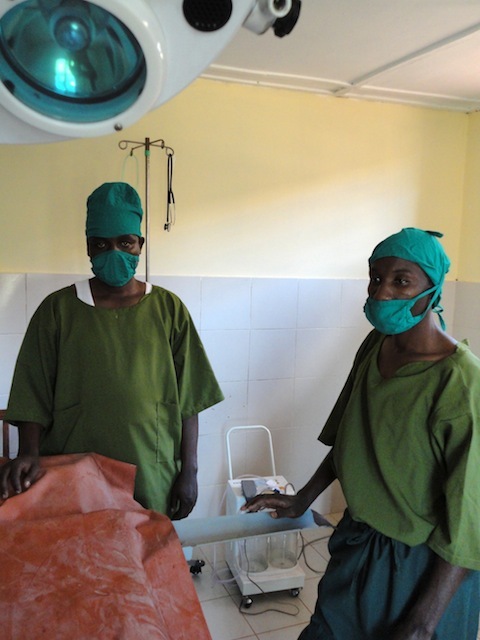 But the Kigoma Region has become one of the first places in East Africa to train assistant medical officers to conduct life-saving c-sections at its rural health centres. After her caesarean, Joanitha told IPS that she was grateful to be able to deliver her baby safely at a health centre. The World Lung Foundation renovated nine rural health centres in Kigoma Region, including the Kakonko Health Centre, under a pilot project in 2009. As part of the initiative, assistant medical officers were trained in basic surgery. “We have successfully handled all our complicated cases and mothers have delivered safely,” Mapinduzi, who is also the supervisor of the centre, told IPS. “When we have a complicated birth, it is like everything has stopped so as to save a life,” he said. Mapinduzi said that when the centre began operating on expectant mothers in 2010, the number of deliveries at the health centre went up to 120 per month from 20, and an average of six caesarean sections were conducted every week. “We have established a network at the grassroots level where women with complications are advised to deliver at the health centre or district hospital. “Previously, some mothers didn’t see the need to come to the health centre, especially those with complications, because they knew that we were unable to help them then. Some would stay at home and wait for the grace of God, while others went to other places,” he said. Tanzania has a high maternal mortality rate: 578 deaths per 100,000 live births. According to the World Health Organization “the maternal mortality ratio in developing countries is 240 per 100,000 births versus 16 per 100,000 in developed countries.” Kate Gilmore, assistant secretary-general and deputy executive director (Programme) of the U.N. Population Fund said that South Sudan had the highest rate in the world with over 2,000 deaths per 100,000. But at one point the Kigoma Region had the highest rate in the country, at 933 per 100,000 live births in the early 1980s. But in the 1980s, a newly qualified gynaecologist, Dr. Godfrey Mbaruku, who is now the Deputy Director of the Ifakara Health Institute, Tanzania’s main health research institution, developed successful initiatives that led to a huge drop in the maternal mortality ratio here – to 186 per 100,000 live births in 1991. While recent statistics are unavailable, maternal mortality in this region is considered to be lower than in the rest of the country. It was Mbaruku’s work here that inspired development partners to set up the project. He told IPS that it made perfect sense to equip health centres to perform surgeries. “The majority of Tanzanians live in rural areas, and you must be joking to suggest that they should access health services at the regional and district hospitals. Mothers are not dying due to chronic illnesses, but because of emergencies,” Mbaruku said. Dr. Amri Mulamuzi, coordinator of the project in Kigoma Region, told IPS that a combination of factors helped reduce maternal deaths here recently. “We have also provided ambulances to all the health centres so they can refer complicated cases to the district or regional hospitals…We also started campaigns on the ground, in collaboration with local government authorities, to ensure that each expectant mother realises that it is important for her to receive antenatal care,” said Mulamuzi. While the Kigoma Region health centres have become a success story, health activists fear that programmes like this are unlikely to be sustainable because they are donor-driven, and will collapse when donors phase out their initial financial commitments. For example, the government’s “Support to Maternal Mortality Reduction Project” that began in 2006, and is being implemented as a trial in three regions, only receives 10 percent government funding. The rest comes from donors. Irenei Kiria, the executive director of Sikika, a non-governmental organisation that advocates for the provision of quality health services, told IPS that there would be no significant change in the country’s maternal mortality rate until the government invested more in it, and translated policies into action. “Things on the ground must change for the government to be seen as serious in addressing maternal health,” said Kiria. “You can’t expect donors to help you with this – forget about reducing the deaths. The government must commit its own resources to reduce maternal deaths,” he said. For example, maternal mortality in Kilwa District, in south eastern Tanzania, is glaringly high. In 2008, Kilwa District statistics showed that the maternal mortality rate was 442 per 100,000 deaths. This is despite the fact that the Kilwa municipal council allocates 40 percent of its budget to health, part of which is for addressing maternal mortality. According to Joanitha Mangosongo, the reproductive health coordinator at Kilwa Kivinje District Hospital, the money is largely spent on purchasing essential drugs for pregnant women and delivery kits. But a lack of medication is not the reason for the high number of deaths in this region. In Kilwa District, unlike other parts of the country where most deaths occur in communities before mothers reach health facilities, over 90 percent of maternal deaths here occur at registered health facilities. It is partially because health facilities have an acute shortage of skilled health workers, said Mangosongo. District statistics show that 80 percent of health staff is relatively unskilled. “This affects almost all our efforts to fight maternal deaths. We are trying to provide on-the-job training and distance learning, but it is proving to be tough,” said Mangosongo. Mbaruku believes that the solution to the high number of maternal deaths in Kilwa can only come after authorities acknowledge that there is a problem. He told IPS that all districts have the same health budget and that Kilwa needs to formulate its own plan to combat the high maternal mortality before it asks for external support.